Volcano seismic waves produce distinct tremor patterns, or "fingerprints," shared by different kinds of volcanoes. Volcanic tremors can mean that an eruption is imminent, or maybe not. When it comes to linking tremors with impending eruptions, researchers are still very much in the dark. In a new study, however, one team of volcanologists revealed the existence of distinct tremor patterns, or tremor “fingerprints,” as they call them, shared among different kinds of volcanoes. Observations of such fingerprints may provide a small advance toward improved eruption forecasting: If, in the future, a volcano produces a fingerprint already found to have preceded or accompanied other eruptions, volcanologists might be better able to say whether an eruption will occur. The team behind the study discovered the fingerprints by looking at seismic signals produced by four volcanoes: Okmok, Redoubt, and Pavlof in Alaska and Kīlauea in Hawaii. 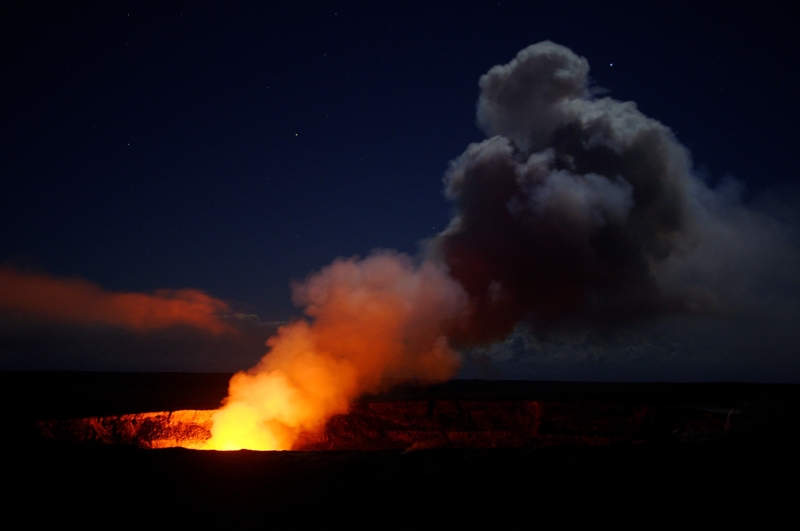 Kīlauea and Okmok are shield volcanoes, which are generally broad, gently sloping volcanoes constructed by relatively fluid lava. Pavlof and Redoubt are stratovolcanoes, which are more conical volcanoes made from lava more viscous than what creates shield volcanoes. Generally, higher viscosity of the molten rock yields more violent eruptions. “There are definitely different types of tremor, and it looks like they might be associated with different characteristics of these volcanoes,” said Katharina Unglert, a volcanologist currently with the University of Exeter Camborne School of Mines in Penryn, U.K., and lead author of the recent study in the Journal of Volcanology and Geothermal Research. “At the very least, it’s one step closer to understanding the vital signs that volcanoes are giving us, and maybe, in the long run, that will help us to improve eruption forecasting,” she added. For each type of tremor, Unglert and her coauthor, volcanologist Mark Jellinek of the University of British Columbia in Vancouver, Canada, analyzed the seismic wave fingerprint, the set of seismic waves of various frequencies and strengths that make up the tremor’s vibrations. One fingerprint can comprise many frequencies, and the team set out to assess whether the fingerprints they analyzed from different volcanoes shared characteristics like their ranges of frequencies or which frequencies were more or less prevalent, explained Unglert. Finding fingerprints in tremor spectra using signals from actual volcanoes is the main accomplishment of Unglert and Jellinek’s research, explained Jessica Johnson of the University of East Anglia, in Norwich, U.K., who was not involved in the work. The spectra are like “white noise,” she said, and trying to identify the differences between sets of white noise can be a challenge. To work through the noise, Unglert and Jellinek used a pattern recognition algorithm that they had detailed in previous work. This algorithm can tease out which seismic wave frequencies may be unique to different tremor signals. For example, the team analyzed tremors from the 2009 eruption of Alaska’s Redoubt Volcano, which lasted from March to July of that year. Before the eruption, there was only tremor, “and then eventually a phreatic eruption started, which means an eruption that mostly involved water, and then we went into a phase of magmatic eruptions, where new magma came to the surface and caused these big explosions,” Unglert said. “What our analysis showed was that the tremor, during the initial phase where there wasn’t much going on in terms of eruptions, was actually different from the tremor during the time period of phreatic and magmatic eruptions,” Unglert said. Before the eruption, more seismic waves with frequencies of about 3 hertz contributed to the spectrum than waves with other frequencies did. Then, after the eruption began, the main contributing frequencies were between 1 and 2 hertz. “These are the different fingerprints,” she explained. In 2007 and 2011, mobile magma within Kīlauea caused eruptions and produced fingerprints with main contributing frequencies of around 1 hertz, similar to Redoubt’s eruption fingerprint. “This MIGHT suggest that this type of tremor is caused by the movement of magma” within volcanoes in general, wrote Unglert in an email, despite one being a stratovolcano and the other being a shield volcano. Still, she stressed that researchers need to do similar analyses at other volcanoes to explore if there is really a connection. Such fingerprints may one day help volcanologists forecast eruptions. For instance, if the fingerprint that arose from Redoubt’s 2009 eruption arises again in the future, “that might mean that we have an eruption coming up, or occurring right now, especially in places like Redoubt or in the Aleutians in general,” said Unglert. The team’s tremor-spotting algorithm is also automated, so “I think they could set it up in a real-time setting and have, for example, an alarm go off when it detects tremor—then that could be really useful for observatories that don’t have many staff members,” said Johnson. Thelen agrees: “If we can tie these spectral fingerprints to a process, that would be a step forward in expanding our forecast window.” For now, Unglert hopes her work illustrates that although volcanoes can indeed be very different from each other, they can also be quite similar in subtle ways. Citation: Joel, L. (2017), “Fingerprinting” volcanic tremors may help forecast eruptions, Eos, 98, https://doi.org/10.1029/2017EO071371. Published on 10 April 2017.